I left my mobile phone at home the other day. I only realised as I got out of my car at the tram stop. Although I had time to drive back to pick it up, I wanted to get into work early to crack on with stuff so I thought I’d go phone-free for the day. I’m sure there are people breaking out into a cold sweat at the thought of being without their phones! 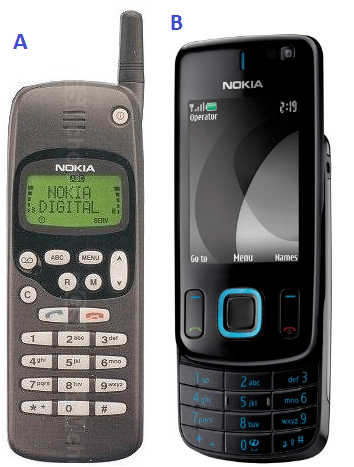 My first phone was the Nokia 1610. Nokia phones were what everyone wanted, back in the 90s and 00s. Very sturdy, with a battery which lasted for days. I think there were only around half a dozen telephone numbers stored in it as it still wasn’t very common for people to carry phones, not among my circles of friends anyway. Over the years, I possessed various phones of other makes, including the Motorola Razr clam-shell, which was probably one of my all-time favourites, but I kept returning to Nokia. In 2009, I switched to my first smartphone, a Blackberry Bold 9700. This was also the first contract phone I owned as I had previously only ever been PAYG (pay as you go). My friends and family all thought it was funny that I chose Blackberry when they had all gone for iPhones but I fell in love with the Blackberry keyboard and still love it. I had nothing against the iPhone but as I already had an iPod Touch and an iPod Nano, I thought I owned too many Apple products already! I’m glad that I didn’t jump on that bandwagon anyway as I don’t have the urge to upgrade to the latest phone – I don’t mind that my Blackberry looks a bit chunky and seems a bit slow when browsing the net – what’s a few seconds?! It is a little annoying that new apps tend to be developed for iOS before Android but as mentioned before, I don’t mind waiting. So back to my phone-free day – what did I miss? That first hour of work, I felt a little anxious and kept thinking about not having my phone. However, as the day progressed, it was out of sight and out of mind. I usually do a bit of matched betting* during my lunch hour on my phone but as I was on a bad run on the each way bets, I was glad to have the break. The only thing I really missed was Whatsapp as that’s how I keep in touch with my family and close friends. I didn’t miss anything else – not Twitter or Facebook. Or scanning blog posts. As I still use my iPod for my music and use a mini Filofax for my diary, I guess that’s why I didn’t miss my phone so much in those respects. I don’t look at my phone when I’m at the gym so again, felt no loss when I went for my work out that evening. Anyway, with no distractions, it felt like I was more productive at work, so perhaps I should have more phone-free days! Would anyone else consider this or is your phone like an extension of your body which you can’t do without? Congratulations on turning an accident into an experiment! I also love keyboards on my phones; I treated myself to a second-hand Blackberry Priv (just over £100) a few months ago as my older keyboard phone was getting seriously clunky and browsing the web was becoming painful. Particularly when trying to use bookies mobile sites for matched betting! Before we carried phones, what did we do if a family member had to call about some disaster? They called the work number or waited til you got home to answer your landline phone! It’s what we’re all used to now, I guess, being able to answer call/texts at all times, almost immediately. I still like reading a proper book so borrow from the library . In between, I use my Kindle – not sure I would like to read a whole book on my phone but I can see the convenience of not having to carry extra bags or items. I’d be happy to leave mine behind. I think the problem is that others would not be so happy! Another problem is that the phone replaces so many other things I used to carry (even occasionally) eg camera, torch, book. It would be great to selectively remove certain things. I’ve never had any social media apps on it, but particular websites and email has been my nemesis. I do block work email at the weekend and evenings now. Having done this the once, I’m considering leaving it at home voluntarily! Ok, maybe not at home but maybe leave it in my bag and only get it out at the end of the day. My friends sometimes complain that I don’t reply to their texts quickly enough – I just say that they’re obviously not working hard enough if they can reply to texts during the day! I don’t think I have that many apps as I still tend to go on websites, but yes, the phone has replaced so many things, except my book reading and music and occasionally camera, I can take much better ones with my digital camera. Interesting experiment weenie. Everywhere I go it seems people are glued to their phones every 5 seconds. I even see many drivers checking their phone as they are driving along busy roads…dangerous. A friend says her daughter sends a text from her bedroom when she needs a cup of tea rather than shout downstairs…and that’s a two bed terrace house! Next challenge, no phone for a whole week…or would that be unthinkable! Haha – I’m guilty of this. I WhatsApp my kids when dinner is ready….beats yelling up the stairs! My sister still shouts – she reckons she can do the texting/whatsapping when the kids no longer live at home! When I had just a normal mobile phone, I was known on occasion to use the phone while driving – I know, bad but it wasn’t illegal back then. My smart phone stays in my bag when I’m driving, I have a sat nav in my car so don’t need to use Google Maps. Although I’m sure when I used to drive with an A-Z map in one hand, it wasn’t any safer! I’m not sure I could do a whole week – my friends and family would worry! Although I might try one day a week at some point! Well done weenie; now you just need to increase the number of phone-free days each week. For me, every day is phone-free day because I don’t have a mobile phone (not entirely true. I need one for two-factor authentication but other than that it lives turned off in a drawer). So I never went beyond a dumb phone and that’s all I still have, switched off in a drawer. With my family on the other side of the world, things like Facebook and Whatsapp have enabled me to keep in touch far easier with them (and for free) but I guess I don’t need to be on call all the time! And Twitter, whilst very informative and interesting, is so distracting! With the long commute I’m not sure I’d leave it at home but definitely while at work it would be better to lock it a locker, I’m sure I’d be more productive that way. Having said that our internet is totally free so I’d probably just find other ways of distracting myself! Tomorrow, I might try just putting my phone in the locker/drawer and just looking at it during my lunch hour (to do my MB, haha!) Definitely will be more productive. Doh, thanks for spotting that I copied and pasted the wrong pic! Sorted now, cheers! My phone broke two weeks ago and I’m about to get it repaired on Thursday. It has been liberating indeed. I’m sure there are some people who have tried to get in contact with me and can’t but the most important people have my email or my Skype so I’m not too worried. I did miss it for using GPS on a trip this weekend. I took a wrong turn and had to guess my way but it was satisfying to get there myself! Woah, two weeks! That must have been some detox, Emily! I sometimes still forget about Google maps and will ask people where somewhere is and will get funny looks! It sounds like you made it through the day without really missing it, which suggests you have a much healthier relationship with your device than a lot of other people I know. I’ve done a series of phone detoxes in the past – these have helped me get rid of super addictive apps, so I’m no longer staring at my phone mindlessly for hours. There’s still more to do though before I am totally comfortable going phone free for a day! I did miss it but wasn’t a wreck so I guess that I do have a vaguely healthy(ish) relationship with it! As mentioned above, I don’t have that many apps, too distracting and any where I can’t turn off push notifications get deleted straight away! Hey Weenie – that’s a great experiment. I pretend I am not addicted to my phone but in reality, I am. As I’ve got older my memory is not what it was – I need my google calendar to tell me where I am going at what time -and I go out from work often. And I listen to podcasts through my phone when walking and waiting around etc. And I’ve started using google pay instead of an oyster to commute, so it’s kinda essential to have the phone with me. Before I had a mobile phone, I used to be able to reel off the telephone numbers of my friends and family. Nowadays, the only number I know is my own! I don’t use the calendar on my phone but do set myself the occasional reminder. I think that we could all benefit from a day going cold turkey. Absolutely! But it would be tough! switch off the push notifications from all (or many) apps! Why? Sometimes, you only want to check when the next tram to the station is. Or if there will be rain tomorrow. And then you have all those notifications distracting you: new e-mails! Plus your sister wrote you on WhatsApp! Not to forget Facebook and other time-consuming stuff. And there you are once again glued to your phone. My boyfriend has disabled all notifications for many months now, and while we were on holidays, he suggested me to do the same. I like it so far. I check the apps when I want and have time for it, not when the apps push me to do so! Good tip, Noemi – I already do that to a certain extent (including removing apps where I can’t turn off notifications) but will check to see what others I can switch off. This week, I’ve been putting my phone in my desk drawer while at work and only looking at it at lunchtime and that’s been fine! I’m glad your experiment went well! I think if you don’t need your phone for work, it might be a worthwhile experiment for everyone to try. Yes, although it was an accidental experiment, it was worth it, just to see how I was and I think I can cope with another phone-free day for some social media ‘detox’! Hey Weenie! I’m just catching up on my post reading. When the demise of 2G invalidated my perfectly good Nokia, I bought another dumb phone. People know I’m unlikely to respond to calls or texts straight away, and they are used to it. I do have an iPad for reading and surfing, but it has limited data which means if I left it at home I’d be OK. I know people whose whole lives are in their phones, and I can’t imagine the sick feeling of fear they would have if they lost it! How have you been getting on? Is the phone still in the drawer at work? I was the last of my friends to get a smart phone but think I would miss it too much to go back to a dumb phone now. Yes, the phone has been in my drawer at work, though not all the time – I do think I’m more productive as a result. Hope things are good with you.